Editor’s note: The service economy of Greece accounts for roughly 80% of GDP. So, one would think that with so much riding on this crucial sector of the economy that the nation would excel in its delivery of service. Alas, that is not the case. 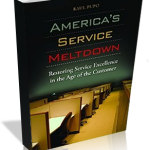 Service across the board in key industries, from energy, to telecommunications; from transportation, to tourism is mediocre at best. Civil servants, many in office for their patronage to one political party or another, are largely indifferent to the needs of citizens, are untrustworthy, do not take their jobs seriously, and excel at finger pointing. The one bright light in this very dark tunnel is international shipping where Greece is the preeminent power with control over nearly 25% of the world’s merchant fleet. That aside, however, Greece has become a philistine nation devoid of its former elegance. Greece faces profound impediments that get in the way of delivering even the most basic service to customers. Bureaucratic inefficiencies, fiscal indiscipline, corruption, vandalism, serious crime, untrained workers, haphazard urban planning which routinely desecrates the environment (Greece, unique among modern nations, does not have a comprehensive land registry which has led to rampant illegal building construction, and which accounts in part for the fire that killed nearly 100 people in the coastal village of Mati in July, 2018), regulatory overreach, confiscatory tax rates, and unions run amok all set the stage for what is perhaps the thorniest problem facing the service sector: Cultural hang-ups which confuse serving the public with servility to a master – the chip-on-his-shoulder and snippy attitude of many Greek service workers leads many consumers to simply vote with their feet. At best, it is doubtful that the service sector in Greece will lead the country out of its profound economic malaise in the near term. At worst, the combination of these factors has the potential to arrest any hope the nation might have of clambering out of its economic black hole. And, if the service economy doesn’t get it in gear the nation is likely to sputter for a long time to come: exporting pistachios and olives simply will not pick up the slack. Tourism, the bread-and-butter component of the service economy in Greece, accounts for nearly one-sixth of the nation’s GDP and one in five employed workers. Over twenty-six million foreigners – including passengers on cruise ships – visited Greece in 2015. But Greek tourism is, by and large, a magnet for cheap vacationers: something like 40% of all visitors to Greece come from the former Yugoslav Republic of Macedonia (FYROM) – which leads the pack with over three million visitors or one and a half times the upstart nation’s population – Serbia, Bulgaria, Turkey, Romania, Albania and Poland. All, hardly deep-pocketed nations. The affluent and educated tourist does not countenance a vacation spot for he and his family where he has to contend with dumpsters filled to overflowing for weeks, traffic nightmares, ubiquitous and vile graffiti sprayed on building and monument walls, stray dogs and cats everywhere, gypsy panhandlers, throngs of rowdy teenagers loitering in public and private spaces shouting obscenities at the top of their voices – police officials unable or unwilling to restore order – barroom brawls, and worse. The recent beating deaths of two tourists, in separate incidents, on the island of Zakyntos is the most graphic example of the shambles that the Greek tourist economy has become. The rule of law and order has been cast to the wind as was further evidenced when the chief of the Athens Traffic Police was attacked by a gang of thugs. In contrast, another tourist hotspot, Dubrovnik, Croatia sited beautifully on the Eastern Adriatic Sea sports castle, building, and church walls that are pearly white and devoid of any graffiti. Amazingly, the city has recovered fully from the devastation that was visited upon it during Croatia’s war of independence waged between 1991 and 1995 against the Serbian-dominated government of Yugoslavia. The airport is ultra-modern and clean. There is no litter or plastic bottles seen on the street and the city empties dumpsters seven days a week. Service workers are hospitable, reasonably fluent in English, and friendly. The city, as a whole, moves about with a sense of quiet purpose. To be fair, some restaurants and hotels in Greece excel in service but they are the exception. Also, there are magnificent resort locations to attract the affluent tourist. The Romanos Resort in Costa Navarino in Messenia, on the Peloponnesian peninsula is a magnificent self-contained property with beaches on the Ionian Sea, outstanding restaurants, and golf courses. On the island of Crete, the standout resort is the Elounda Beach Hotel. Also, a self-contained resort it is on the northeast coast of Crete sited on the aquamarine waters of the Mediterranean Sea. The Elounda Beach Hotel is a favorite of well-heeled Russians (restaurant menus and marketing brochures are printed in Cyrillic among other languages). The Danai Beach Resort in Sithonia, a peninsula in Chalkidiki, in the northeast part of the country is surrounded by magnificent forests. The resort itself exudes serenity, displays sandy Aegean beaches and is expertly managed. These three resorts are standouts but, again, they are the exception to the rule. The contraction of the economy which began at about the time that the Lehman Brothers collapse in 2008 rocked the worldwide financial markets, and the severe austerity measures imposed on this small nation of eleven million people by the Troika – the International Monetary Fund, the European Central Bank, and the European Union – has clearly made things worse. But slapdash service is nothing new. With so much riding on tourism, Greece nonetheless ranks 31 out of 141 nations in the Travel and Tourism Competitiveness Index for 2015. This index measures a country’s ability to sustainably develop a business in the tourism sector. The tax regimen is as oppressive as they come and is perhaps the principal culprit making Greece one of the leading tax cheats in Europe: the corporate income tax rate is set at 26%; the individual income tax rate at 46% for incomes over $40,000 is clearly confiscatory; the VAT tax rate is 24%; and the social security tax rate is set at 42%. The capital gains rate is a modest 15%. Real property taxes amount to a not too well disguised subterfuge because although the rates are modest the government exaggerates the value of the property and therefore the amount of taxes due. Furthermore, property taxes assessed in one community can be spent by the national government in another community. It would be as if, say, a Chicago homeowner saw his property taxes spent in Miami. The inheritance tax is progressive rising to 10% for estates valued at over 300,000 euros with a 150,000 euros exemption. This last, in combination with a paucity of financing opportunities to rehabilitate long neglected properties, forced approximately 135,000 Greeks to turn their backs on their inheritances in fiscal 2017. The regulatory climate in Greece is a further abomination. According to the Organization for Economic Cooperation and Development (OECD), the regulatory climate in Greece is nearly the most restrictive among member nations – only Turkey, Greece’s bellicose neighbor to the east, has a more restrictive regulatory climate. Fixing the nation’s balance sheet remains a top priority but unless opaque, obsolete, and complex regulations are streamlined or better eliminated all of the financial housekeeping in the world will be for naught. Two anecdotal, albeit powerful examples, born of first-hand experience should drive the point home: 1) a seaside taverna owner on the island of Crete who owns a small fishing vessel is disallowed from selling his own catch at his own restaurant. The fish he sells at his taverna must come from a distributor; 2) a woman on the Ionian island of Lefkas who owns a small-footprint supermarket finds it unlawful to sell figs from her own orchard at the supermarket. State auditors demand to see an “invoice” evidencing the purchase of the figs she sells. Now comes the deleterious effect of the Middle East refugee crisis adding a toxic element to Greece’s cocktail of woes. The crisis, was born of German Chancellor, Angela Merkel’s open border conceit and financial leverage over a diffident Greek government but it is aggressively fueled by Turkish smuggling bands. Many Greek islands of the Eastern Aegean – Kos, Lesvos, Samos, and Chios, have been particularly hard hit – have been turned into public sewers by the over one million migrants which have overrun historically pristine beaches, desecrated Christian crosses, complained about Greek food and free accommodations, caused civil disturbances, and helped fuel a surge in prostitution. In the light of all of these developments, it remains to be seen whether tourism can become a sustainable engine of growth over time. The ancient Greeks – and until not so long ago most Greeks – were strong adherents of the precept of philoxenia. The term, nominally, translates into English as hospitality. But the meaning of the term runs much deeper than that. In its full meaning, the term is understood as the attitude that a host exhibits in being friendly, generous, courteous even loving to strangers whether they be from the next village or the next continent. In my experience, philoxenia has died on the vines of economic, social, cultural, and political decay. Greece enjoys sensational seascapes, landscapes, archaeology, and history. But for tourism to snap back as an important catalyst for the growth of the economy it will take much more than that. A key government priority, in partnership with private enterprise, must be to break the back of the culture of bad service which has become institutionalized in Greece. This will be a long and hard slog but it can be accomplished through education and training programs, as well as through incentives and penalties designed to ensure the necessary behavior modification of service providers whether they be public or private. It must be said, too, that customers and especially foreign tourists have a role to play here by demanding a higher level of service than the nation is dishing out. A second priority is the rebuilding of the nation’s infrastructure, particularly on the islands, to include upgraded airports, roads, ports, telecommunications (among OECD, countries Greece ranks last in fiber optic broadband penetration), waste haulage, water supply (summer customarily brings water shortages to many islands), and sewage systems. Any significant influx of tourists is sure to stress these systems to the brink. And, it remains to be seen how long the well-heeled tourist endures these arduous conditions before exploring alternate vacation destinations. Clearly, the country’s topography with its many islands makes the task far more difficult and expensive than if it were dealing with a single land mass. But that is the hand that Greece has been dealt and its vistas are what makes the nation unique in all the world. It isn’t clear how the nation’s financial distress will allow it to finance the vast improvements to infrastructure that are sorely needed. Improbably, however, the country found a way to spend up to $2.4 billion to upgrade its F-16 fighter fleet. This is a follow-up to a previous deal which cost taxpayers in excess of $2.5 billion for German submarines. That deal was severely marred when investigators found the Defense Minister, Akis Tsochadzopoulos, guilty of taking bribes of up to $120 million. The nation’s recalcitrant service culture and its crumbling infrastructure, among other factors, stand in the way of attracting not just affluent tourists but also, foreign investment. It is no surprise that Greece currently ranks dead last in Europe in attracting foreign capital as a percentage of GDP. And, according to the Economic Freedom Report published by the Fraser Institute for 2014, Greece ranks 86th, out of 159 nations, in the world. This ranking puts Greece one notch ahead of the African archipelago of Cape Verde, and two slots behind the landlocked Central Asian nation of Tajikistan when measured on the basis of five broad metrics of economic freedom. Clearly, a foreign investor seeking political and economic stability, market size, transparency, above-average labor skills, conformity with the rule of law, a pro-growth tax regimen, and regulatory compliance will look to risk his capital elsewhere as they are scarce commodities in Greece. As a philhellene, it saddens me to say that I am not optimistic that anything positive will emerge in Greece anytime soon. The nation now seems devoid of the ancient cultural value of axioprepia so critical to its self-esteem and to the image it projects on the world’s stage. At the height of the financial crisis the negative stereotyping of Greeks clearly intensified but the stereotyping always had a grain of truth: the financial meltdown simply proved to be an added accelerant. A citizen – a community, a nation – is axioprepis if he behaves with dignity such that he is seen by others in a good light in all that he does. That critical cultural value, I’m afraid, has become obsolete. Marxist-Socialist Prime Minister of Greece, Alexis Tsipras, is unabashed in his praise for Che Guevara (his son’s second name, Ernesto, is a tribute to the genocidal maniac of the Cuban communist revolution), Venezuelan Dictator, Hugo Chavez, leader of a failed coup attempt in 1992, whom he, mind-numbingly attributed as, “an inspiration for the ideas of democracy…” and whose funeral he attended in 2013, and Fidel Castro, whose funeral he also attended in 2016. Service, financial, and structural problems in Greece will require a largely free-market solution as improbable as that might seem under the current government. If Mr. Tsipras’ model of a sovereign nation’s success is his idol Chavez’ Venezuela, a country made all the worse by the electorally questionable accession of Chavez’ more plastic but just as ruthless successor, and former bus driver, Nicolas Maduro; a country which has witnessed over two million citizens exit the nation in despair; currently riven by a world-leading homicide rate per capita; with widespread shortages of food, water, electricity, and medicines; government oppression and quite literally on the verge of anarchy – despite having the largest proven oil reserves in the world – then an involuntary exit from the Eurozone is probably the opening chapter in what is likely to be an epic Greek tragedy. IS THE UNITED STATES AT END OF EMPIRE?